You can donate directly through VirginMoney Giving. 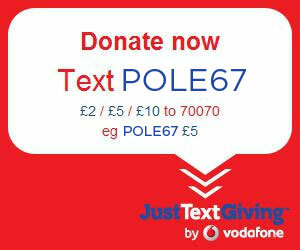 To donate through your mobile: Text POLE67 followed by the amount you want to donate to 70070. Your mobile operator will pass 100% of the text donation to the FUND. The minimum donation is £1 and the maximum allowed is £10. All donations must be in whole pounds sterling. Donations sent via text will usually incur your mobile operator’s standard text message fee. Please refer to your tariff for details of your standard text message fee. You will receive a text message receipt and the chance to add Gift Aid. For further information about JustTextGiving by vodafone please visit justtextgiving.co.uk. If you require an alternative method of donation, such as bank transfer, or would like to donate a regular amount or a larger amount, please get in touch with me by email.